While waiting outside for my 3.5 year old to finish her ballet class, I overheard some parents talking about schools for their kids. Naturally, my ears pricked up. One (Singaporean) parent said she had found the perfect school for her daughter. I was intrigued! Her criteria? The teachers had been teaching at the same school for over 20 years. I know fabulous teachers (as I’m sure you do) who have been teaching for more than 20 years, and I do not mean to take anything away from them. I also know fabulous teachers who are only just beginning their careers, and I feel the Mum who judged a good school by the fact that the teachers had been there a long time was missing the boat. Longevity does not necessarily equal a good teacher. Longevity at an international school doesn’t equal a good teacher either! The cynic in me might think (upon hearing a teacher has been at the same school for 20 years), what’s the package like at THAT school? Some kids may blossom under a certain teacher, and others may wilt. Caring, passion and determination are my measures of a good teacher. They can just as easily be found in teachers new to the profession as they can on those with decades of experience. 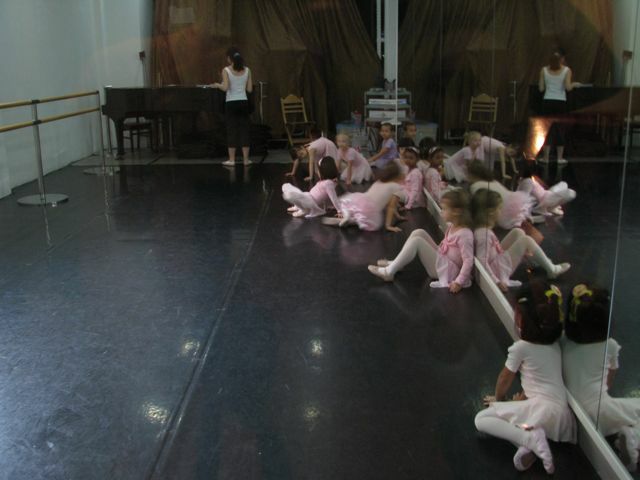 The parents in question had their daughters in the ballet class for a trial lesson. It was interesting hearing their interpretations of how the lesson was going and what they thought of the teacher, based on their observations through the glass window. In my opinion, you could not wish for a kinder, gentler teacher than my daughter’s ballet teacher. She makes classes fun (there is much pretending to be flamingos, tigers, fairies etc, which appeals to my daughter’s imagination). She never appears cross at anyone, and is one of those beautiful people who you can tell is a dancer just by the way she holds herself. My daughter adores her. The parents of the girls who came for the trial lesson judged her unsmiling and boring. In the above photo (taken as the kids were entering the class), there are fewer than 10 children in the lesson, but the day they attended there were about 16-20 3-4 year olds. The teacher made sure everyone was participating, having fun, and enjoying their experience. I take my hats off to early years teachers on a daily basis. Just getting them standing still is one thing, let alone doing any ballet! It’s a hard job being a teacher. It’s got to be even harder having over-involved parents staring in at you, watching you teach. It makes me even more determined to make sure those good teachers out there know how good I think they are. This entry was posted in Uncategorized and tagged ballet, teachers by klbeasley. Bookmark the permalink. Well written KL with all the perfect sentiments. I teach in an unorthodox fashion..movement not ballet….but find a sense of humour coupled with the right amount of seriousness takes the edge off teaching the physical skills – these skills are more embarrassing to acquire and experiment with, at a community level. It teaches people to accept themselves with a more forgiving attitude. I agree with you 100 and 10%. My primary field was Early Childhood Education. I have been in the field for over 20 years. In order to earn a living one had to job hop…unless you wanted to make 20 cents every six months. Job hopping destroyed my resume despite all my work experience, education (I have two degrees), and dedication to the families and children. I pains me that someone with textbook knowledge in a completely different field can get paid twice as much as me because they had longevity at a bank. Yes, that is going on out there….